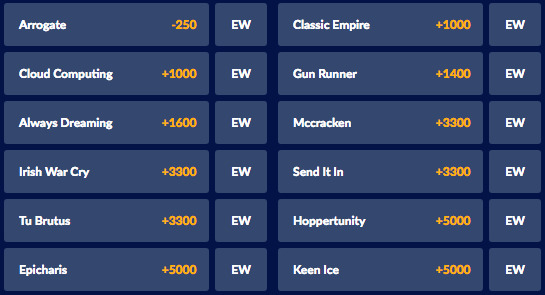 Barring something unforeseen, the 2017 BC Classic is a race where just about every handicapper will land on the same horse for the top spot. In a sport where hyperbole is frequently bandied about to describe its biggest stars, Arrogate is deserving of every ounce of praise pundits have heaped upon the four year-old horse. While still lightly raced, Arrogate is widely considered the world's best racehorse, amassing a staggering $17,084,600 in his first eight starts. The Bob Baffert-trained gray surely benefitted from running in the newly minted Pegasus Cup worth $10, but his impressive string of victories also includes the Travers Stakes, the 2016 Breeders' Cup Classic, and the Dubai World Cup - all group or grade 1 races. While the rest of the prospective field is nothing to sneeze at, Arrogate is simply 3-5 lengths better than anyone else. It's worth mentioning that Arrogate himself was an unheralded three year-old colt until August of 2016. The point being, things can change quickly in the sport of kings. For now, however, Arrogate is sitting on a golden throne and the contenders are subjects in his palace. The list of Breeders' Cup probable contenders must begin with Gun Runner who actually looked home free in the 2017 Dubai World Cup before Arrogate proved his otherworldliness by overcoming a completely wretched start to pass every horse in the field, including Gun Runner who was a clear second. Gun Runner is a classy horse even if he's not in Arrogate's league and will be a popular pick underneath to round out the exacta and trifecta wagers. Those handicappers looking for a bigger price may approach Kentucky Derby winner Always Dreaming with caution after the colt ran surprisingly poor in the Preakness Stakes. It will be intriguing to see how Always Dreaming develops over the summer with races like the Travers and the Haskell among his likely targets. Looking at some of the bigger prices, Hoppertunity may not be the most exciting runner in the field, but the veteran runner also trained by Baffert has proven to be steady and consistent. He can light up the toteboard in the exacta and trifecta wagers if able to stay healthy. Health, in fact, will be the biggest question mark for the BC Classic contenders, but progression is a close second. Just how much the three year-old crop develops over the summer and early fall will dictate how this race shapes up. A horse like Preakness Stakes winner Cloud Computing is an interesting one to follow as is Classic Empire. Both have big ability and are capable of improving. Three year-olds have won the past three runnings of the BC Classic, and have fared consistently well in the race since its inception. It's difficult, however, to imagine any three year-old approaching Arrogate's level any time soon as long as the champ maintains anything close to his usual form. Arrogate would be just the second back to back winner of the Breeders' Cup Classic joining Tiznow who won the race in 2000 and 2001. Del Mar has a reputation as a quirky track that horses either love or hate. To this end, the Pacific Classic may be the most telling prep race in 2017. Arrogate is the kind of talent that comes along every 20 or 30 years in the sport of horse racing. While he will probably be whisked away to stud immediately after the 2017 Breeders' Cup Classic, handicappers and racing fans can only lust with wonder about how good he might be. Arrogate will presumably get two prep races before the big race. Assuming he wins both with ease as predicted, he will be the shortest price favorite in the history of the Breeders' Cup Classic. With these thoughts in mind, it's important for bettors to remember a few strategic and historical points as the BC Classic approaches. First, deserving favorites often go to post at more generous odds than expected in huge races like the Kentucky Derby and BC Classic. Maybe, just maybe, the public will let Arrogate slip away at 3/5. 1/2 may even represent fair betting value to some handicappers. Secondly, those looking to beat Arrogate won't exactly be without hope. In a game where truly anthing can happen, keep in mind that the races aren't run on paper. Man o' War lost to Upset, Secretariat lost to Angle Light and American Pharoah lost to Keen Ice. Finally, the BC Classic will be an excellent betting race regardless of Arrogate's heavy favoritism. The exotic betting pools will remain huge with plenty of opportunity to snag a price, or beat the favorite for a life-changing score.